The proximity of southern Russians, Ukrainians - and more specifically, Belorusians - to the Germanic group is also confimed by the phylogenetic reconstruction of classical genetic markers, such as HLA haplotypes. IN dendogramm, published in Boldyreva's PhD thesis, Belorusians cluster with Czechs, Austrians and Belgians. How good are that figuring out the direction of gene flow? Would if the Southern Russians helped to create the germanic population? "How good are that figuring out the direction of gene flow? Would if the Southern Russians helped to create the germanic population?" That depends on how far back in time you want to go. Autosomally, Northern Europeans are sufficiently removed from Mediterraneans that one can argue for a different LGM refuge. 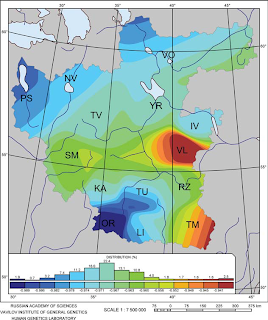 Even before LGM, it is likely that there was a lot of gene flow from the northern plains and the Danube to the steppes north of the Black & Caspian Sea - simply because these areas were connected by easy travel and provided similar food support. After introduction of agriculture, central and northern Europe were culturally united by LBK and its successors. Most scholars believe that people that can be considered Germanic in culture and language ranged from slightly west of the Rhine river into much of the Polish plains and south thereof during all of the first millennium BCE. There are very early Germanic loan words into the northern branches of Finno-Ugric (earlier than into Baltic or Slavic). Such studies as well as archeology support the notion that Gothic tribes expanded even further southeast in the centuries just before Slavic expansion northwest (and north, and northeast). This is pretty well documented with virtually no room for speculation. But yes, I would agree that 2,000 - 3,000 years ago, people in much of what is now Poland, Slovakia, and parts of the Ukraine were autosomally rather close to Germanic people (the same way Hungarians to date are very close to Germans, Czech, Austrians, Slovenians, etc.). Well, This confirms what we already know, the Goths migrated from the Baltic to the present-day Bielorussia and Ukraine in 200 AD. I did not named the Bastarnae because their origin is unclear, although it was a very well known people from the ancient chroniclers. Probably it was a confederation of Celtic and Germanic tribes, which became similar to the Sarmatians, but it is possible that it bring germanic genes in thearea , before the great Slavic invasion. After the invasion of the Goths 100,000 of them were settled within the Empire and lost their identity in a very short time. It may be misleading to project so far into the past (early 1st millenium AD) present-day ethnic identities such "Slavic" and "Germanic." The quote re Slavs below could also be applied to other eastern European groups as well. eventually become an accepted fact in the 10th century and later." The gene flow could travel either way up the Vistula, etc. In fact, more likely SOUTH to NORTH (ie from the forest-steppe region of the East Carpathian and NW Pontic region to the Baltic). The former has always been a "population oven" from where peoples expanded north to the Baltic and south to the open steppe (periodically). Finally, there is no credible proof that the Goths "came from" Gotland. The Goths formed where they always lived - in the lower Danube and NW Pontic region. And FJB is correct in agreeing what Paliga stated.